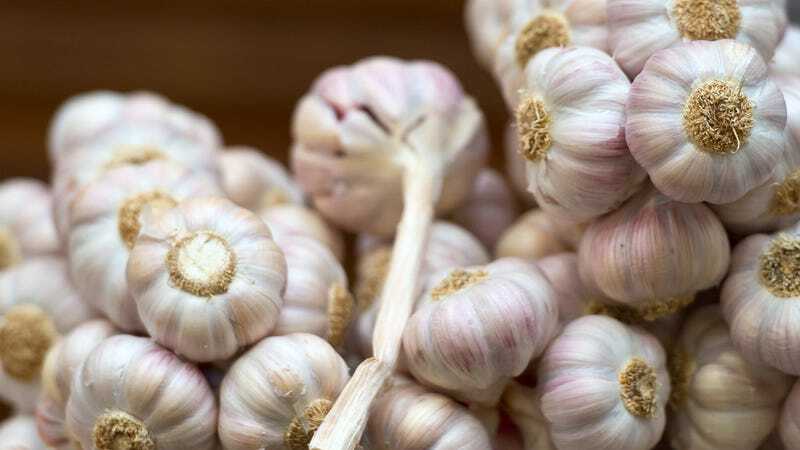 Garlic is delicious, but it likely won’t help your cold. For many of us living in North America, the worst of flu and cold season is already here. Personally, I’ve had two colds nearly back to back since New Year’s. So it’s an opportune time to run down the long list of remedies that won’t actually prevent or help you recover from these pesky infections—as well as a few that may really work. For starters, let’s clear out the absolute chaff. Any product with the word “homeopathic” pasted on it should be avoided like a person sneezing on the subway. I’m talking about products like Coldcalm or the obnoxiously named Oscillosoccinum. Homeopathy, not to beat an old drum, is one of the dumbest ideas to have any amount of credibility still attached to it in modern times, and that’s saying a lot. There’s no plausible reason why they should work, and more importantly, no good evidence showing that they do work. Moving on, there’s no shortage of so-called natural and herbal treatments said to either shorten or prevent colds. But there’s not much to get excited about here. The UK organization Cochrane, long known and respected for its comprehensive reviews of medical literature, has found little to no good evidence that commonly touted cold remedies like echinacea, garlic, or treatments advertised as Chinese herbal medicine can mitigate a cold. And many of the studies that do show a cold-fighting boost tend to be poor in quality, such as studying only a small group of people or not controlling for the placebo effect. It’s not just alternative medicine that comes up short. Antibiotics are often prescribed to people complaining of cold symptoms. But the germs that cause the illness we would call a cold are viruses, not bacteria. So taking antibiotics for a cold is like tossing a bucket of ice to help clean up spilled milk—a completely worthless effort that will probably just make your day more unpleasant. Oh, and it’ll also contribute to the evolution of impervious superbugs, so there’s that. Antihistamines are slightly better, since they might help tamp down the severity of a cold in the first day or two. But they don’t seem to treat symptoms like nasal congestion, runny nose, or sneezing. And they don’t work for kids at all. Nasal sprays containing steroids are similarly lackluster against the cold, according to the best available evidence (though more research might be needed). There’s no consistent evidence showing that over-the-counter cough medicines that contain compounds such as dextromethorphan (Robitussin) are worth taking, since their benefits are unclear but their risks, including the potential for them to be abused, are well-known. There are some cold medicines that are better than others. Nasal decongestants containing pseudoephedrine, such as Sudafed, have more solid evidence for their short-term effectiveness, but these must be purchased in small qualities and behind the pharmacy counter, as pseudoephedrine is one of the compounds that can be used to produce methamphetamine. Even when used as directed, it can cause strange side-effects like hallucinations and seizures, especially if taken in too high a dose. Nonetheless, if you’re looking for quick symptom relief, pseudoephedrine is likely your best bet. A drug marketed as a safer alternative to pseudoephedrine, phenylephrine (found in Sudafed PE), appears to be wholly ineffective at treating cold symptoms. In fact, phenylephrine’s reputation has gotten so bad lately that some doctors have called it a glorified placebo and pushed for it to be taken off the shelves entirely. And research has found that all of the cough and cold medicines mentioned above are even less likely to work for children, and what’s worse, they are more likely to produce harmful side effects in kids than in adults. Whew! That’s a downer. Alas, not all hope is lost. There is some decent evidence that natural remedies like zinc or vitamin C supplementation can help prevent colds during the winter season or slightly shorten your illness once you have it. For kids, a simple spoonful of honey might actually help alleviate a cough better than cough medicine. And yes, there’s even some very limited research suggesting chicken soup could be useful for the cold. The studies supporting the more natural remedies have their limitations, mind you. The problem in general is that colds, by their very nature, are short-lasting. So it’s hard to suss out what really works, since most anything can seem to have cured you if your cold was only going to last a day or two more anyway. But given that some remedies in particular are harmless and could work, I’d feel much more secure recommending zinc lozenges and vitamin C pills to my sniffling friends and family than I would a basket full of cough suppressants or the latest Airborne product. Really, the only foolproof treatment for the common cold, at least right now, is time.